Labor Day has officially come and gone, the temperature has started its initial decent to zero (and beyond) and football season is fully underway. 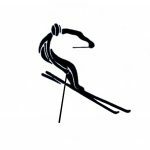 For most this simply means that fall is right around the corner, but for ski racers it means it’s time to start preparing for the upcoming season. In the NEMS Summer Newsletter I said to expect a different but truly epic schedule. Well, the wait it finally over! This season’s schedule is a mix of new and old with some twists along the way. But before we get into the exciting details, I want to take a moment to thank Bill McCollom for working tirelessly over the summer to put this schedule together. The schedule is never easy and this year’s was especially challenging with Nationals being in the East this year. Great job Bill! Now on to the good stuff. The battle for The Sise Cup begins at Mt. Sunapee this season with a GS/SL opening weekend. The GS course is well-known as a thigh burner and will put that off-seasoning conditioning to the test right out of the gate. From here we’ll head up to the Middlebury Snow Bowl for the 2nd Annual Kelly Brush Challenge. With a slightly different race format and a number of racers coming from outside of NEMS, this race is sure to keep things interesting. Speaking of interesting, the very next day NEMS will be taking the show down Rt. 89 to Whaleback! Yes that pitch you always see from the interstate and dreamed of dropping is new to NEMS schedule! NEMS will be holding its first ever race at Whaleback this season. Whaleback is a great place for a Masters slalom race and Masters have been training slalom there for years thanks to George Merrill. The varying terrain of the race trail will certainly make for a very exciting race. Next up on the schedule will be long-time NEMS favorite, Stratton, for a weekend of white-knuckle speed racing. This will be the first opportunity for NEMS racers to bust out the big sticks and test your nerves on the always exciting Super G course. Of course we encourage everyone to attend the Super G training the day before. It’s a great way to dust off the speed cobwebs as well as an opportunity to get some extra training in before nationals. Oh, and don’t forget about the GS race the following day. Helpful hint: make sure your edges are very sharp! From speed skis to speedy feet, we’ll be getting a bit more technical the following weekend as NEMS descends on Suicide Six for what is considered to be one of the better slalom hills around. The timing couldn’t be better since it’s the last slalom race before nationals and Suicide Six is considered to be the most challenging slalom course we race on. Dreams have been made and crushed here. Are you up for the challenge? Did someone say “challenge”?! You must be talking about the Annual Beer League Challenge at Ragged Mountain. That’s right! The only race in New England where beer league teams go head-to-head to settle the always contentious question of whose beer league is better. As one of the few team scoring races of the season, the Beer League Challenge takes both strategy and skill to prevail. Bragging rights (and free beer) are on the line, so make sure to get your team on board and represent! Don’t have a team? Don’t worry! Teams are always in need of an extra racer or two, so you’ll be in high demand. OK, so here is where things are going to get a little weird. I did warn you that this was coming, so bear with me. Nationals might be over but don’t put those skis away just yet! We still have lots of racing ahead. 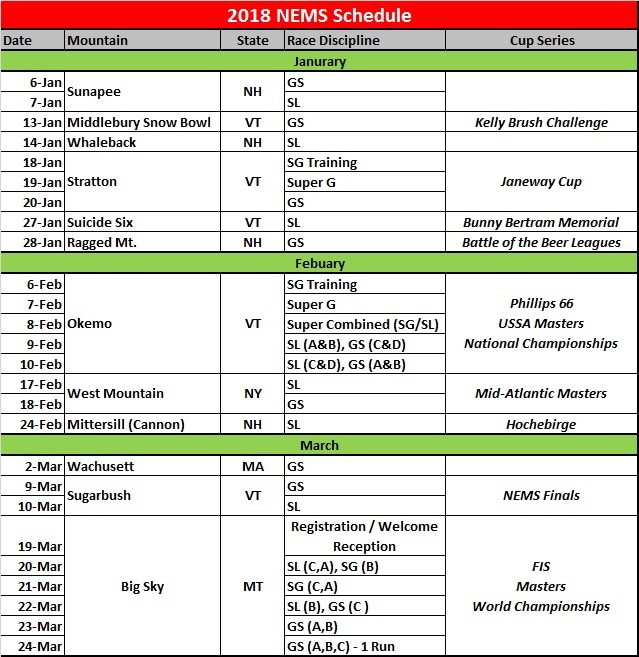 Following what is sure to be an insane week at Okemo, NEMS is heading over to the Empire State where we’ll be teaming up with the Mid-Atlantic Masters, our newest Masters division, for some friendly competition at West Mountain. This GS/SL weekend will count towards Sise Cup points. A race that has been 2 years in the making…the Masters are coming to Wachusett Mountain!! This will not only be the first time NEMS will be racing at Wachusett, but the first time NEMS has ever held a race in Massachusetts. 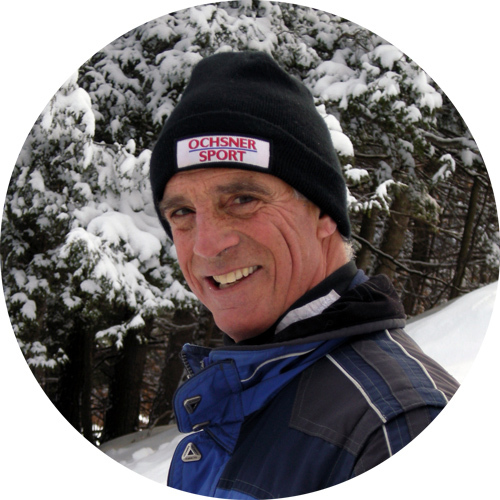 Many of NEMS current racers and alumni have ties to Wachusett, which just so happens to have the largest adult ski racing program in the country. The race will be a top-to-bottom GS course on Smith Walton where races can expect to be challenged from start to finish. We will have more details on this race soon, so for now just make sure this one is circled on the calendar. To close out the season NEMS will be heading back to an old favorite, Sugarbush. Nope this isn’t a dream, we’re back baby! I can’t think of a better way to cap off what should be an incredible season than with races at a mountain in which NEMS has such an amazing history. As with previous years, this will be a Fri/Sat weekend with the Finals Banquet to follow. Details are still being finalized for the banquet but we will make those available as soon as possible. Needless to say we have a busy and exciting season ahead so we hope you are as eager for the snow to start falling as we are. We are always looking for opportunities to provide the best possible schedule so it is possible that additional races and/or clinics might be added. 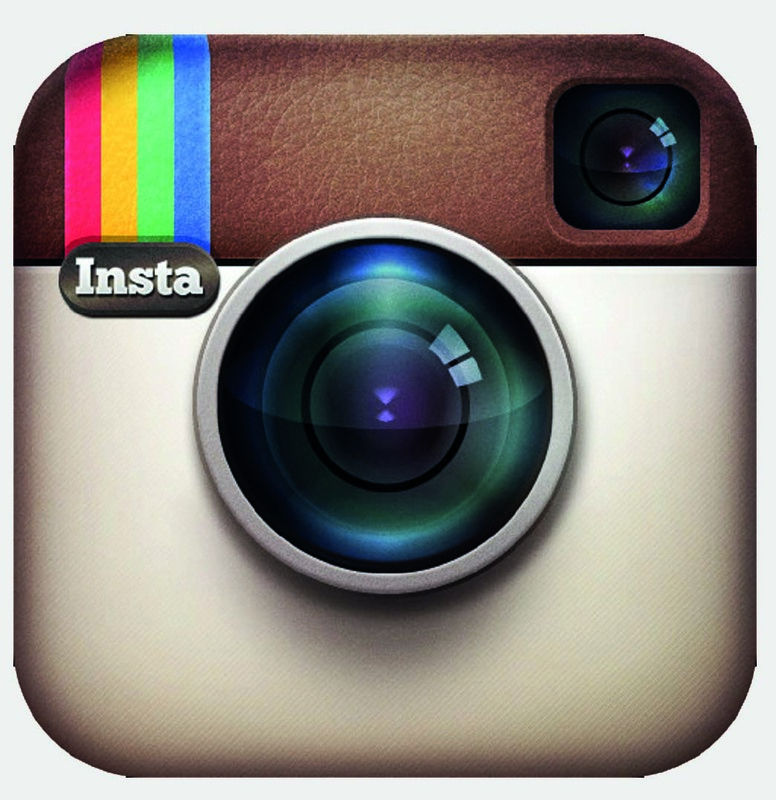 Keep an eye out for updates as well as training opportunities. As always, if you have any questions please don’t hesitate to reach out.